The manufacture of equipment, machinery and consumer goods involves numerous steps that culminate in final assembly. Some operations are performed in-line and others off-line, the choice depending upon the manufacturing process used, production rates and logistics. In general, the more operations that can be performed in-line, the greater the efficiency and the lower the amounts of work in progress (WIP). However, as production lines become longer, their vulnerability to holdups increases and throughput is determined by the slowest process. In such situations, it makes sense to streamline a lengthy process by producing items off-line or to consider alternative manufacturing methods that are faster and more efficient. There are several reasons why it makes sense to have a combination of in-line and off-line manufacturing. Firstly, some processes take too long and would hold up the line; a good example is powder coating, which requires a certain amount of time for the coating to cure. Secondly, it may be possible to manufacture items at a higher production rates than the production line.??? Examples include metal stamping and deep drawing processes. In both situations, offline manufacture makes sense because facilities can be used for other processes as well. The first step in assessing what processes should be taken off-line is to identify production bottlenecks. To do this, an analysis of each operation should be made to identify its true duration. Because manufacturing processes often include sub-processes that feed into the production line, these must also be considered. Production lines generally operate on a pull basis, which means that operations toward the end of the line are slightly faster than earlier ones; this prevents items from piling up. However, when a process is too slow, a bottleneck exists and the output of the production line is limited by the slowest process. 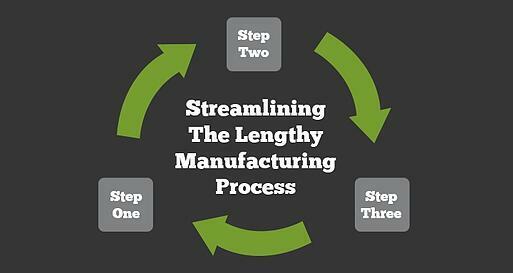 In many instances, the way around a bottleneck is to change the manufacturing process. This is often the case with operations that require a significant amount of machining or a number of fabrication operations. One way around labor-intensive processes is to evaluate the possibility of manufacturing the part on a stamping press. This particularly applies to parts that were not historically considered suitable for pressing but which now can be contemplated as a result of technological development. Examples of this include hydroforming and deep drawing. High draw ratios: Deep drawn parts can be readily produced with a draw ratio that exceeds 10. This means that the length of the drawn part can be 10 times the largest outside diameter, and this facilitates the manufacture of long, thin cylindrical components. Low cost: The cost of deep drawn parts is generally lower than other forms of manufacture, even when the cost of tooling is factored in. High volume: Production volumes are determined by press stroke rates and are significantly higher than machining or other fabrication processes. Fast setup: Tool changes on a well equipped deep draw press are fast and require minimal setup time. Product quality: Off-press quality is high, and in many cases parts can be assembled without the need for further processing, usually only cleaning. Added operations: Additional operations can be incorporated into the tooling, such as notching, slotting, thread forming and name stamping. If assembly line volumes are limited because of lengthy manufacturing processes, it may be time to re-evaluate deep drawn stamping as a way of increasing throughput and plant utilization.